NDP in Quebec may be OK. Elsewhere don't hold your breath. As both the NDP and Liberals slug it out winning Quebec they become more and more un-electable in the ROC. BC check out the polling numbers Eric keeps putting up and you will realise that the CPC will lose the election. What I see in those polling numbers is Trudeau coming back to earth, with the CPC remaining stable. The Liberals need a credible platform. By my reckoning, they have published one meaningful policy document since 1993 (Chrétien's Red Book), and that was Dion's Green Shift. For what so they stand? The latest EKOS poll (historically heavily biased Green and Liberal) has the Cons ahead in the ROC. BC If you go to the top of this page and look over to the right you will see the latest numbers put up by Eric. As of Nov 19. Do try to learn. BCVOR is arguing that the Liberals are behind the Conservatives outside of Quebec, at least in the last EKOS poll. He is right about that, a rough estimate would give the Conservatives 35% to 34% for the Liberals in the RoC. But that is just one poll. My averages would suggest the Liberals have roughly 36% support outside of Quebec, with the Conservatives at about 35% (and the NDP at 19%). By the way, in the 2011 election the Conservatives had roughly 47% support in the RoC, so that is a big drop for them. The NDP had about 27%, and the Liberals about 20%. And 35 to 34 has to be less than the MOE ?? Anyway I'll go with your averages over a single poll. Thanks. And I'd suggest a loss of 12 % has to have significance. The latest by-election the polls had the Liberals ahead in a virtual tie... This turned out to be a an 8.5 CPC win. Has there ever been an election where the Liberals did better than the polls had them? The Liberals did about as well as their polling in 2008 and 2011, and beat them in 2006 and 2004. Eric even the CBC would see that the 19% they got was significantly less than the polls any and all polls said they would get. 30% Conservative v. 35% Liberal would likely produice a Conservative minority government given the NDP lead in Quebec. Since, Justin is unable to stand up for his own M.P.s I don't think Mulcair and Harper will have much trouble during the election campaign. Trudeau will prove to be a weaker leader than Dion or Ignatieff. BCVOR, you're seriously using all the polls done in the campaign? There was a little thing that happened during the campaign called THE CAMPAIGN. Opinion moved. The polls accurately pegged Liberal support on election day in 2011, as they did in 2008. They under-scored the Liberals' actual result in 2004 and 2006. You're also wrong to say there was no poll under 20% for the Liberals. The majority of the final 13 polls done had the Liberals under 20%. Ipsos Reid, for example, had them at 18% in its final poll. Speaking of the NDP, what's your rating of Sudbury now that Cimino has resigned? If the NDP loses next by-election it then Horwath should step down. I'll be adding that one to the By-Election Barometer today. Éric, your point about the balancing act of the NDP in Quebec is fair, but you could equally turn it around... It shows that the NDP is appealing to a broad cross-section of the Quebec population - just what strong political parties aim for - most notably, the Liberal party (at the federal or provincial level). A fair point as well, but I think any coalition like that is inherently unstable. The PCs managed a broad-based coalition until it collapsed dramatically in 1993. A coalition that spans such incompatible loyalties like those in Quebec can only last so long - but it could be extremely effect for as long as it lasts. One could equally argue that the NDP is ahead of the game by basing it's core on centre-left policies rather than federalist/sovereignist ideology like the other parties. The proliferation and radicalization of sovereignist parties on the provincial level (PQ, QS, ON, arguable the ADQ) and the disintegration of both the Liberals and Bloc in the last election would tend to confirm this. That leaves, the Bloc, the Liberals, and the Conservatives slugging it out for the centre-right vote. Éric and Guy, picking up from some of your points, the federalist/sovereigntist dichotomy is not only less significant than before, I think it has always been largely overstated and misconstrued. Even in the days of the 1995 referendum, support for separation was not large - making up a minority of the "sovereigntist" vote - many people who voted Yes in that referendum were soft-sovereigntists who wanted to make a point rather than separate. And many of those people ended up voting for the (federalist) NDP in 2011; it would be easy to argue (as some have) that the NDP is a valid representative of Quebec nationalist interests (a different thing than sovereigntism, though they overlap). The other misconception about federalism/sovereigntism is how the two positions fall on the political spectrum. The conventional wisdom is that sovereigntism=left, an arguable assertion in the days of Levesque but a non sequitur since. Bouchard and the PQ and BQ leaders since him have been centrist at most, but more often right-of-centre and neo-liberal/neo-con as now epitomised by PKP. Progressive sovereigntists have been leaving the PQ for QS and elsewhere, and abandoned the BQ dramatically in 2011. So much for the official parties of sovereigntism. But even beyond the official political domain, sovereigntist organisations and movements have also been right wing-populist or corporatist-populist rather than left/progressive. Think of the Société Saint-Jean-Baptiste, for example. I think sovereignty movements are always inherently conservative. In a increasingly interconnected world separatist movements wish to limit the interaction among nations especially in relation to their own-they are at base isolationist. Therefore, independence movements are formed that would limit the intervention of other states in the "domestic affairs" and or international affairs of a proposed newly independent state. They impose anti-modernist policies such as bill 101 or sharia law that disregard the "others'" human rights and they come up with simplistic explanations to combat complex problems. If we were sovereign; we'd have so much more money everything would be fine, was Alec Salmond's mantra during the recent Scottish referendum. Quebec sovereigntists do the exact same claiming Quebec over pays into Confederation even though every study of the last 50 years has determined this to be untrue and Quebec is a net beneficiary from Confederation, but the myth persists precisely because separatism is based upon a faded ideal of yesteryear not logic of the present day. Separatism is a movement that idolises the past. Eric, you sayed that when the Liberals are ex equo with the NDP in Quebec (32 vs 34) they get much lower in therm of seat ( here 21 vs 49 ) because the liberal vote is concentrated in Montreal. Here we can see that they are behind the NDP in mtl (-17%) but higher in ROQ (+7%). Why the difference is still big between them? Not Montreal per se, but concentrated among non-francophones. That makes sense as the Liberal will probably win back Outaouais ridings with a sizable non-francophone minority in the 20-25% range (most of that consisting of anglophones). What is the election outlook of the NDP's McGill student MPs. "“His comments are insensitive to the victims. He should apologize,” Freeman, a 25-year-old MP from Quebec, told The Sun Thursday. “Comments like this remind us why we should abolish the Senate and elect more women to Parliament.”"
Now that Harper has slain the BQ separatist dragon it should not be too difficult for a somewhat qualified Liberal Candidate to provide a significant Challenge to Ms Freeman. How has Harper slain the BQ - surely it was the NDP. Harper merely swept away the right wing fringe - without gaining any seats for his troubles. Before Harper took over as PM there was a realistic chance that Quebec might separate. The CPC ideology of smaller decentralized government sets up a structure that welcomes Quebec into the federation. Quebec may still be more socialist than the ROC but being their very own country is no longer a serious priority for anyone. There seems to be a grass roots understanding that Quebec's fiscal policy for the last couple of decades is unsustainable. This is the first step of their move to the right.... or at least to the middle. Senator Campbell is absolutely right. Nobody in Canada has the right to remain annonymous if they accuse another person of a crime. The presumption of innocence is a fundamental principle of Common Law, for trudeau to punish his M.Ps without a fair trial is ridiculous and demonstrates how far the Liberals have deviated from their principles. Trudeu is unable to to stand up to Mulcair, Mulcair has claimed the high ground without even delineating the charges against the two Liberal M.P.s. If Trudeau can't stand up to Mulcair how can Canadians expect Trudeau to stand up for Canada? How can anybody think Trudeau believes in the rights set out in the Charter when he allows the NDP to run roughshod over the rights of Liberal M.Ps? If trudeau had any intestinal fortitude he would demand the NDP accusers stand up in the Commons and rise on a point of personal privilege. Then the Commons as a court may decide on the matter. Trudeau has shown what he truly is-a pushover. "Before Harper took over as PM there was a realistic chance that Quebec might separate." Based on what? The 1995 Referendum? BC There is no evidence to show to show any of what you're saying is true. Harper and the CPC is generally detested in QB and for their part the Federal Government has done nothing to bring them back into the fold. The CPC has done nothing to make a smaller decentralized government, the only thing they have done is deregulated food, environmental safety, all the while increasing funding and giving new and extended power police and law enforcement. The Neo-Con/Neo-liberal dream of fiscal sanity and less government is just that a dream. The truth is they have run up the debt and made it easier to interfere in our lives via the roll back of civil liberties. Please all of you read Chantal Hebert in today's Toronto Star . "How the Conservatives are slaying Mulcair for Trudeau" !! Hebert hits the nail on the head again, and I'm surprised the Conservatives haven't figured this out yet. Regular statements from Conservatives that Trudeau wants to sell drugs to kids, supports Islamic terrorists, and insult his mother and father are having the same effect as the old Conservative claims that Paul Martin supports pedophiles. It makes the Conservatives look over-the-top and promotes the Liberals as the party with the best chance of defeating them. It gave Trudeau the profile to define himself to the Canadian that Tom Mulcair never had, and turned a leadership race bump for Trudeau into a sustained lead with a polished coat of teflon. The liberals must be praying for more Conservative attack ads. Every new attack ad has seen the Trudeau/Liberal ratings go up. And the Cons can't figure it out ?? They don't work and it's so obvious Guy. Keep it up and the Harperites will lose big time. Attack ads work, if they didn't parties would not use them. Adrian Dix went from a double digit lead to a 5 point loss on election day partly due to the "risky Dix ads". Thus far there is no evidence to suggest young Trudeau has improved in the polls due to Conservative attack ads. Tom flanagan's infamous comments didn't win the Tories the election but, the 2004 campaign did turn a Liberal majority into a Liberal minority government. I'm not suggesting Flanagan's press release is responsible for Martin's loss of a majority government just pointing out that the notion these ads somehow benefit the Liberals has thus far no empirical data to stand on. The Iggy attack ads of "just visiting" ended Iggy's political career and set the stage for Layton's famous debate night jab of; "most people don't expect a promotion..." The Dion puffin ads didn't help Dion's leadership either. Attack ads work, so far they haven't found a the right argument against Trudeau but, they'll keep trying and eventually probably discover an argument that works. Trudeau invites the attacks by being so vacuous, if he had a single policy to debate on anything other than legalising weed but, he doesn't. The fact of the matter is if you legalise weed underage kids are probably going to get their hands on it-that is not anything but common sense; you legalise a controlled substance it will increase the supply and availability. If you're from Ottawa we all know people who when they were 18 drove to Quebec to buy booze so it is really not much of a jump to say kids will be attracted to "legalised marijuana", it's common sense, a trait long in short supply within the Liberal Party. "Attack ads work, if they didn't parties would not use them. " Please lose the blinkers or CPC blinders !! Eric I'm sure has the numbers to refute what you say. PLUS !! Unlike all the others you say, Justin was a complete UNKNOWN !!!! Not a politician until the Liberals dragged him into view about a year ago. Thus there was NOTHING to attack but the name. But the Canadian public actually likes the name as an Icon !!. So attacking the son of a Canadian icon doesn't smell of intelligence, eh? Plus they aren't apparently working that well against Mulcair either. I would suggest their day is past !! Please lose your own blinders and stop attacking others. I guess the LPC doesn't need attack ads when they have people like you who attack others without provocation for them. Political parties are not in the habit of wasting money on advertising that doesn't work! Why you would think political parties are in the habit of throwing money on advertisements that are ineffective is beyond me, such an attitude is illogical not to mention without evidence! The Trudeau name has plenty of attributes that could be criticized. PET was hardly an icon for many Canadians, his record is mixed at best and full of egotistical manoeuvers and political, economic and other mistakes. He opened the constitution to stop separatist appeal among les Quebecois but his inability to get Quebec to sign the constitution and agree to a new constitutional settlement lead to 30 years of constitutional wrangling and the near dissolution of Canada in 1995. His jealousy toward Turner nearly destroyed the Liberal party and set the stage for Iggy's disastrous performance in 2011. Icons don’t run away to India so they can avoid fighting the Nazis, they resign their cabinet post and take a position in the trenches below their status for the good of their country. Finally Justin Trudeau has been a Politician since, 2008 when he won election to Parliament. If Justin has no history worth attacking that is probably evidence of how little he has done. This idea that the name Trudeau should be revered is reminiscent of James I and the divine right of Kings. Only Monarchs are chosen by their familial ties. What has Justin accomplished to earn the respect of Canadians? He hasn't even had a good day in Question Period yet! I'm not attacking young Trudeau I am criticizing an ill-thought out policy, his only policy and I am criticizing Trudeau's inability to put forward any meaningful ideas. Even with the legalization of weed Trudeau has not put forward any examples of how legalization would work and be implemented. How much tax would weed be subject to? Would tax revenue be earmarked for specific programs (mental health perhaps)? Who and where would grow? How would he ensure criminal organizations are prevented from infiltrating the industry? What preventitive measures would he take to dissuade chikldren from smoking dope? All questions a strong leader would be able to answer. But that is the problem with Trudeau isn't it? He was elected leader based on his name and nostalgia for the 1970's by aged baby boomers not his credentials or accomplishments. "Before Harper took over as PM there was a realistic chance that Quebec might separate. There is still a realistic chance Quebec will seperate, the only change has been in the lngth of time for separation to come about. It would only take a swing of a few percentage points for the BQ to to go from a handful of seats to a dozen or more. Notwithstanding what you write about Trudeau there is evidence that negative advertising works-ask Adrian Dix and Michael Duhkakis. Secondly, it is not really a sustained lead the Liberals enjoy it is a lead within the margin of error. So to turn it around the Tories have held a sustained lead whil e dealing with some unpopular policies. I would argue that neither the CPC nor the NDP are responsible for the BQ's fall from grace. Quebec nationalists did in the Bloc. They collectively chose over a number of years to move on from the BQ narrative of sovereignist watchdog in Ottawa. The NDP was the accidental recepient of this displeasure with the Bloc. Most sovereignists knew little of and cared even less about NDP policy. They simply elected to move on in a convenient political vehicle. And with Beaulieu's election as BQ leader, the chances of a Bloc resurgence have become even slimmer in the next election. Both good and bad news for Mulcair's NDP in Quebec. The good news for them is that they are highly competitive, even at 34%-32% lead against the Liberals, I could see the NDP winning the majority of seats in the province due to their vote efficiency there. I've said this before, but I believe the NDP's incumbency in Quebec will play a huge factor. Furthermore, progressive vote splitting is not an issue in Quebec as in Ontario, so the Liberals cannot claim that a vote for the NDP is a vote for the Tories. If polls don't improve, the NDP could also claim to their Quebec base that they will hold a Liberal minority to account and extract progressive and pro-Quebec policies. The bad news for them is that they have an unstable coalition of support in the province, that has the potential to shatter in dire circumstances. This results in Mulcair tiptoeing and dithering on provincial matters while the Liberals, Tories and the Bloc can be more vocal in their opinions. Trudeau would seem bold, fresh and honest, while Mulcair will come off as an old school politician mincing his words. 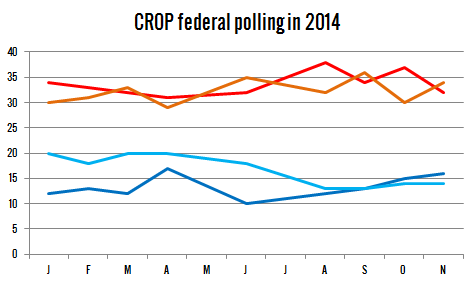 Another issue is that most people do not think the NDP will form government in 2015. So there also the notion of ditching the "lost cause" NDP and voting Liberal so Quebeckers have a seat at the government table. "Unstable coalition"? The NDP has consistently polled at roughly 30% for the last year and a half and 25% or better since, the last election in Quebec. All coalitions have the potential to break apart but, usually require a 'shock" in some form as a catalyst. Perhaps the NDP-Liberal"inappropriate behaviour allegations" scandal will be that catalyst. At the moment I think the stability in the polls argues against any split within the NDP coalition. While the NDP and Liberals are going at it no holds barred for Quebec there was an interesting poll by Abacus comparing Trudeau to Mulcair. 56% of those polled said they would vote for whoever to get rid of Harper. Does that mean that 44% are comfortable with Harper as PM? If the NDP/Liberals have a campaign as poor as Ignatieff and Duceppe there is an obvious chance that Harper could have a Blue Surge through Quebec. About a year out from last election all talk would have been how the BQ and the Liberals were going to divide up the 63 seats they currently held in Quebec.... and then at election they were left with 11. With respect, I'll stick with Chantal Hebert's assessment that nowhere in Canada was there a greater desire to get rid of Harper than in Quebec. Couple that with a fair point that Harper's is the most right-wing federal government in Canadian history and I fail to see how the CPC could surge in Quebec. Am I missing something? I don't think so. Just the poll saying that only 56% of Quebec people have a high priority in getting rid of Harper. Harper is hardly rightwing compared to Martin-Chretien governments that slashed spending to social programs and the Provinces. By contrast Harper has increased government spending by 21% over 2006 levels, well above inflation. Harper may have re-instated "Royal" for the Navy and Air Force but, Chretien accepted a royal order from The Queen, the Order of Merit. Chretien suppressed the democratic right to protest by the RCMP's unlawful use of force in dispersing protesters at the 1997 APEC Summit. Calling Harper's Government the "most right-wing federal government in Canadian history" is nothing but, leftwing propaganda espoused by partisans who have no policies to trumpet. They are unable to promote a Liberal agenda because their leader, chosen like a Monarch for his familial ties( how very conservative), has no ideas to promote. You claim to fail to see how a Conservative surge could take place in Quebec but, look at the polling averages. The Conservatives have held their popularity since the last election. If Quebec has the greatest desire for a change of Government would n't one expect support for the Tories to have fallen since 2011? Quebec has always held a large number of conservatives hence, support for separation (a conservative ideology that harkens back to french colonial times) and the history of conservative parties such as the Union Nationale, CAQ and ADQ, the strong showing of Macdonald in Quebec in the 19th century and Mulroney and Diefenbaker in the 20th. 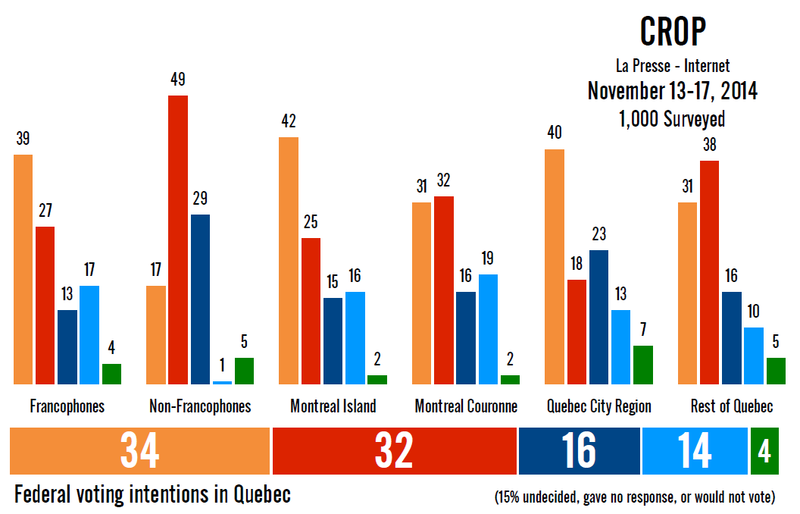 Quebec like the rest of Canada has diverse array of political opinions, those who wish to paint Quebec as a monotone colour of red or orange fail to see the diversity of Quebeckers not to mention ignore the nuances. Yes, they want to get rid of Harper, and I'd be shocked if he got more than 8 seats. But I think many forget how progressive Quebeckers are compared to the rest of Canada. A ot I've met will not vote liberal as they actually consider them a bit right wing. So don't think them wanting a progressive alternative will mean to jumping to Justin Trudeau when they get desperate to get rid of Harper. I take your point about Chretien and Martin slashing the social transfer to help get the federal budget on its way to balance. One wonders how Harper would have handled it -- but that is neither here nor there. I agree that Quebec has always had right-of-center support, particularly in the Quebec City and Chaudiere-Applaches regions. That support is relatively solid but to project support beyond that is challenging to say the very least. Think back to 2006 when we got Luc Harvey elected in Louis-Hebert. That was a temporary upward blip. After eightyears in power, I doubt we will see such a move again going into the rumoured spring election. In short, moving beyond their base will be quite an accomplishment should it come to pass. No one saw the Orange surge either. With the Liberals and NDP stuck at 30% in Quebec a swing of a few points could double the Conservative Quebec caucus. I don't think anybody expects the Conservatives to win 50 seats but, they could easily double their Quebec caucus. The election of Luc Harvey and the other 9 Conservative M.P.s was not a temporary blip, the 2008 election returned 10 Conservative Quebec M.P.s and the 2011 election 5 M.P.s. Today the Conservatives are at 16.5% in Quebec and so there is a strong chance all their incumbents will be re-elected and possibly a pick up of a few seats. You need a strong symbol as your anchor in Quebec in order to make further inroads. In 2004, 2006 and 2008, that was Josee Verner, now a Senator. I don't see Maxime Bernier playing that crucial role. The other thing that I would refer as troubling is that the CPC will be running losing candidates from other elections both in Louis-Hebert and Beauport. To my mind, a party confident of a breakout would be running name candidates that hadn't lost in previous election cycles. The psychology strikes me as wrong if that party expected a considerable uptick in their support. I disagree parties need a strong symbol in Quebec because I don't beleive Quebeckers are as superficial as that statement would imply. Harper has a strong front bench of Francophones with the likes of Steven Blaney, Christian Paradis, Denis Lebel, Bernard Valcourt and of course Maxime Bernier who still enjoys a high degree of personal popularity. I do not understand your second paragraph, according to the Conservative Party website no candidates have been nominated for Quebec so it appears your "information" is not accurate. There are some advantages in re-nominating past candidates since, they already have some name recognition, know the riding et cetera. It is unusual that a party like the NDP can nominate a slate of unknowns and get most of them elected. It is public knowledge that Sylvie Boucher will be running again in Beauport. It was in La Presse. As for Louis-Hebert, I may have changed parties in 2009 but many of my friends remain on the CPC riding EDA. It's not my place to reveal his name (we both voted No on merger in 2003) but he is an accomplished lawyer in Quebec City. CAQ voters vote NDP, lol, that says it all about Quebec voters. All I can say is that provincially, CAQ voters second choice is the QLP.